Technologies of records: five Russian startups in the sports industry | ТехноСпарк - создание и продажа технологических компаний. Moscow saw the Sport Innovation forum that was focused on the latest technologies in the sports industry. As it turns out, Russian startups have a thing or two to offer the market of “goals, points, and seconds.” Forbes Life chose the most curious achievements in sports science and technologies displayed at the forum. Description of the Russian know-how: “Neurotechnologies aimed at boosting an athlete’s capacities is a kind of neurotraining based on the neurointerface with artificial intelligence,” explains a heading of one of the chapters in the manual of the Terminator. It is all about getting to grips with the algorithms of how the brain works. While presenting the development, Gennadiy Kovalenko, partner in the iBrain Company, warned that his company is made up of programmers, not doctors, though the technology was initially intended for sick people. The non-invasive (with no intervention to the organism) neuro-interface was intended to be used in post-stroke rehabilitation. It allowed the immobilized patient to control an auxiliary device, artificial limb or computer application through signals in the brain. The technology can be used in the sports industry as well. For example, during post-injury restorative activities or as a sort of simulator to boost certain capacities. Artificial intelligence used in the Russian method can simultaneously recognize up to four movements made by the athlete hooked to the program. If those movements can be recognized, they can be trained. Sensors pick up the information when the person is, for instance, raising their hand or kicking a ball. The computer receives certain signals from the brain, a code of the performed movement, which can later be modified by the program that shows a way to bring it as close as possible to the reference standard. The ReadSense genome center is in charge of decoding DNA and detecting genetic diseases. It is especially important for athletes in terms of estimation of how much of a physical load their bodies can endure, whether there is a risk of a cardiac crisis during physical activity and how susceptible they are to ligament-related injuries. The tests use any kinds of samples that contain human DNA: blood, or saliva. At Sport Innovations, the company presented their genetic test Cardio RS aimed at early detection of genetic causes of sudden death that has no counterparts anywhere in the world. The test was developed jointly with the leading cardiologists and geneticists of the Central State Medical Academy under the Administrative Department of the President of the Russian Federation and Russian Cardiology Society in 2018. It analyzes genetic disorders that lead to sudden cardiac arrest and which are impossible to diagnose using any other methods. Statistically, about 1% of the Russian population have this complex of genetic disorders, and the risk of sudden death increases exponentially with the increase in physical activity. According to the world statistics, over the last 10 years there have been a few hundred cases of death in athletes related to sudden cardiac arrests. The test is intended for detection of genetic variations in the sequences of more than 450 clinically significant genes related to genetic cardiovascular pathologies. If the test reveals genetic anomalies, the athlete is given an appointment to see specialized doctors for a rigorous checkup. “The test is recommended for professional sports clubs that work with children and teenagers, since it is exactly at the stage of transition to a professional career in sport that it is crucial to determine all related risks as early as possible,” – says Gleb Speshilov, Head of ReadSense. Another relevant test for athletes that is now being developed by the specialists of ReadSense is intended to detect genetic mutations related to higher risks of injuries: abnormalities in the flexibility of ligaments and tendons. The BD-Sport innovative startup, which is a service that recognizes sports movements, is based in Perm. The distinctive feature of this technology is in the capture of a given movement by a special video cam. The athlete’s electronic “avatar” is made up on the computer without any markers that have to be attached to the athlete’s body. The BD-Sport solution enhances the technology of computer vision with the principles of biomechanical models. The technology recognizes and defines in real time the precision with which the technical elements have to be performed during the training and competitions and also helps referees to evaluate the technique the exercises are done in. BD-Sport can also be used to visualize the television image to involve spectators into the streaming of competitions. As experts suggest, the annual average growth of the global market of sports analytics accounts for almost 40%, and by 2022 it will reach the volume of $4 bln. At the beginning of 2018 the BD-Sport development received some backing from the Innovation Promotion Fund. “In the last 10-20 years all sports have demonstrated a growth in speed and complexity of their elements. There’s no objective way a human can keep track of them. It forces referees to come up with controversial decisions, and makes it complicated to collect data about the rivals, or efficiency of this or that athlete. It has proved to be possible to use biomechanical models without any sensors and still recognize and evaluate the sports movements and elements,” – points out one of the founders of the projects Aleksandr Azanov. The ever increasing number of mobile apps, including those that use the Internet access, couldn’t have gone unnoticed in the market of sports innovations. Statistics for the years of 2012 to 2015 show that the number of online devices in the world had grown from 10 to 15 billion items, and by 2020 their number will have grown to over 50 bln. The senior manager of PwC in Russia heading the group that is engaged in providing services to sports organizations, Aleksandr Kardash, and the investment manager of iTech Capital, Maksim Shavrygin, shared their vision of the “digital revolution that is in full swing in the sports industry” in their joint presentation. Currently the most demanded and popular startups are likely to be those intended for the broad target group of amateur athletes. Take the Fitswarm app for example, it is a tool that helps to set up long-distance interactive training sessions for groups. Racefilly is an app that organizes joint runs and long-distance competitions between the users. Strava is an international social network for lovers of various kinds of sport worldwide: running, cycling, triathlon. Ovao is a device that measures the basic characteristics of the physical state of the swimmer during training and lights up the indication of their measured heart rate inside their goggles. Football and basketball professionals may enjoy the Instat Scout platform that has put together detailed information about each and every player. The platform can be also useful for trainers, scouts, and analysts alike. Let’s not forget about Instat Index either, the algorithm of multiple-factor estimation of the footballer’s performance. There is a unique training center intended for UFC that trains athletes in mixed martial arts using the latest technologies (data analysis, wearable devices, sensors and special medical equipment) to develop best ways for athletes to train, eat and recover throughout any of the training cycles (before the bout, recovery after the bout, off season, rehabilitation). The 316lab Company brought their football simulator Teqball to the Sport Innovation expo; this is a tool that helps develop technique and phychophysical qualities in athletes, such as endurance and attention span. 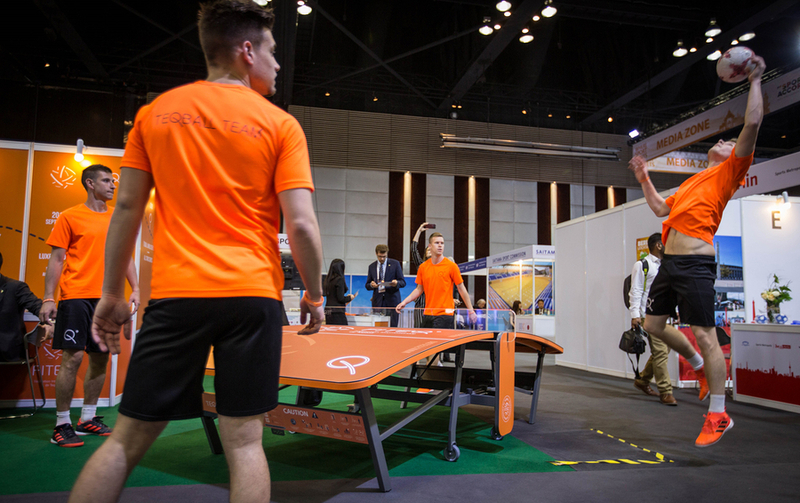 The simulator resembles a ping-pong table: the same net in the middle and a similar height, but the edges of the table look a bit downward from the net to the player. To play Teqball, one has to hit the ball, just as in football, with the head or feet. The simulator helps the footballers of various levels effectively develop their motor performance through its functional versatility. Teqball had been used by the national teams of France, Croatia, Belgium and Brazil in their preparation for the 2018 World Cup. By the way, of all the teams mentioned above two made it to the finals and one to the semi-finals. Teqball is now included in the training program of six of the national teams and over 40 football clubs.